Crouse-Hinds Condulet® Series 5 Type LB conduit outlet body features die-cast aluminum construction with aluminum acrylic paint finish. It has trade size of 2-inches and 71.2-Cubic-Inch capacity. This NEMA 3R rated conduit outlet body with threaded connection, comes with screw-on cover and neoprene gasket. It measures 10.2-Inch x 3.1-Inch x 4.24-Inch. This 2-Hub conduit outlet body comes with tri-head set screws for use on EMT conduit. It acts as pull outlets for conductors being installed. It offers openings for making splices and taps in conductors. This conduit outlet body has tapered threads and integral bushings for protecting wire insulation. 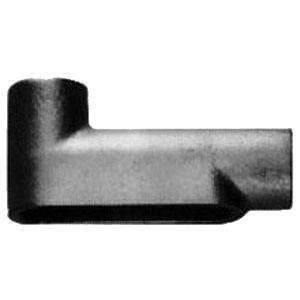 This conduit outlet body is useful to connect conduit sections and provides taps for branch conduit runs. It accommodates conductor of size 3/0-AWG. This conduit body is suitable to make 90-degree bend in conduit runs. It provides access to conductors for maintenance and future system changes. Conduit outlet body is UL listed and CSA certified.